A German neo-Nazi group has been staging flash-mob protests that echo fascist rallies of 1930s, utilizes YouTube to achieve '"mortality." 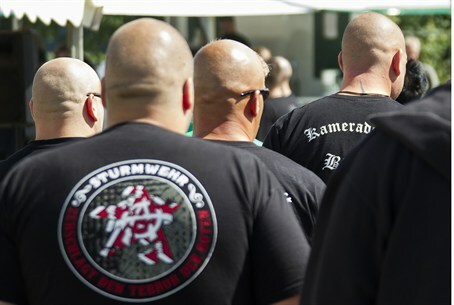 A German neo-Nazi group has been staging flash-mob protests that echo the fascist torch rallies of the 1930s and then exploiting 21st century technology to make them go viral. In a demonstration last May in Bauzen, Germany hundreds of black-clad figures with white masks rapidly and unexpectedly converged in a street carrying torches and signs with extreme nationalist slogans. The crowd dissipated before police forces could arrive, Germany’s Die Zeit newspaper reported. The scene evoked the days of the Third Reich, when the Nazi Sturmabteilung (SA), meaning “Assault Division,” would march with torches held high during night rallies as they saluted Hitler, according to Die Zeit. Applying Nazi methods to the "Digital Age," the group, calling themselves "Die Unsterblichen" (The Immortals), stages flash mobs in cities across Germany and then circulates the footage on YouTube in an effort to achieve "immortality." Several videos of the fascist protests, many of which have received tens of thousands of views, conclude with the slogan "Make your short life immortal," or "So that those to come don't forget that you were German." The "high-tech mob" organizes their marches via text messages so authorities have a more difficult task at figuring out where they will turn up next, CNN reported. The group's website encourages others to organize similar flash mob demonstrations, in order to "become immortal." According to Die Zeit, the group uses the outdated word "Volkstod" on their signs, intentionally recalling the days of National Socialism. The word, meaning “National Death” has been used by neo-Nazis to describe what they perceive as the degradation of the German race under democratic governments and in a multicultural state. Police have searched over a dozen homes of neo-Nazi members in hopes of uncovering the group’s central leadership. Dr. Hajo Funke, a professor at the Free University of Berlin, told CNN he believes the "Immortals" are hoping to attract young people to their cause with the dramatic and viral displays. “It’s a very simple idea: Put masks on your faces and represent the danger to the people,” he said.